Peel the potatoes and prick them with a toothpick. Thereafter, soak the potatoes in cold water for 10 minutes. Remove the potatoes from water and mix with curd and salt. Set aside for 1 hour. Heat ghee in a large pot. Add onions and fry for 1 minute. Add the prepared paste and fry for another 1 minute. Add cumin powder, chili powder and turmeric powder. Sauté for few seconds. Add the potatoes along with the mixture. Pour 2 cups of water and stir to mix. Cover the pot and cook till the potatoes turn soft. Add green peas, cream and sugar. 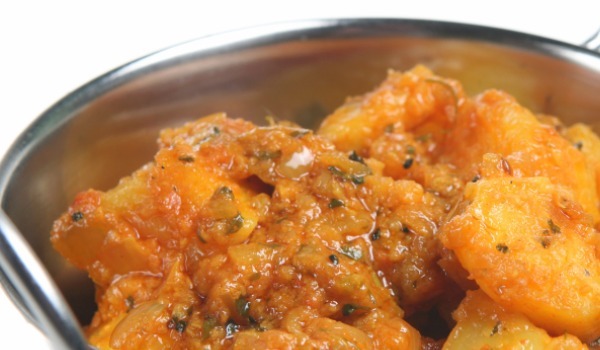 Serve hot with Indian roti or steamed rice.